The Stylus 1 is equipped with a 12Mp, 1/1.7in backlit CMOS sensor that was also used in the Olympus XZ-2. Although its design is similar to Olympus’ retro-styled EM-5, it’s slightly smaller. It measures 116.2x87x56.5mm and weighs 404g with the battery and card on board. The TruePic VI image processor has been borrowed from the E-M5. On the top plate you’ll find a Mode dial with the familiar MASP modes, as well as iAuto, Art, Scene and Photo Story modes. These provide in-camera post-processing and montage creation functions. Along with the shutter release and zoom switch, there’s a dedicated movie record button and an Fn1 button which can be assigned to any of eight functions. On the back, the Stylus 1 boasts an electronic viewfinder (EVF) with 100% coverage. There’s a Live View mode which transfers the EVF’s display to the tilt-able, 3in 1040k-dot LCD screen. The 10.7x zoom iZUIKO lens has a film-equivalent focal length of 28-300mm. The wide f/2.8 aperture can be used throughout this zoom range. A ‘barn door’ style lens cap also features but you can remove this if you want. Two-dimensional lens-based image stabilisation is on hand for low-light shooting, and the Stylus 1 has an ISO range of 100-12,800. The shutter speed ranges from 60secs to 1/2000sec and there’s a Bulb mode for very long exposures. For those who like to connect their smartphones to their cameras, the Stylus 1 has Wi-Fi functionality. This enables you to view and transfer images between the camera and a smart device. You can even fire the shutter from a smartphone using the Olympus Image Share App. At 404g the Stylus 1 feels substantial and more serious than a conventional point-and-shoot compact. The concave grip is coated in textured rubber and this provides a secure purchase. The Fn1 button sits a little too far away from your thumb, but the Fn2 button can be assigned to any or all of 16 different functions including the built-in ND filter and drive modes. The integral ND filter is a useful addition, and reduces the amount of light that enters the lens by a value of 3 f-stops. It’s handy for shooting longer exposures in bright light. The Stylus 1’s constant aperture of f/2.8 throughout the zoom range sounds impressive, but, due to proximity of the rear element to the sensor and the small sensor size, this is actually equivalent to an aperture of f/13 on a full-frame camera. This makes the Stylus 1 less ideal for shallow depth-of-field shots. This isn’t a dealbreaker though, as it does lend itself to detail-rich scenics. The AF system’s modes include Single AF, Continuous AF, and Face Detection AF, which on the whole worked really well. We did experience occasional hunting though, owing to the Stylus 1 relying on contrast-detect AF. We also noted a dip in AF performance in low-light, but it was very effective in daylight. The 1,440k-dot EVF delivers 100% coverage of the frame and turns on automatically when brought to your eye. It performs well with only a slight amount of lag evident. The 3in 1,040k-dot flip-out touchscreen is excellent when you need to shoot from awkward angles. It flips down by 50° or up by 80° to assist with high or low level shooting. An impressive feature is the Hybrid Control ring around the lens. This feels similar to a focus or zoom ring on a D-SLR lens, but on the Stylus 1 it can be assigned to control focus or aperture values. Switching between the two is done via a lever positioned around the Fn2 button on the front of the body. The focal length ranges from 28mm, which is wide enough for a landscape shot, and stretches to 300mm, which is long enough for sports photography. This makes the Stylus 1 an impressively versatile compact. If you crave even more zoom power, you can pick up an Olympus 1.7x teleconverter for an additional £69. This increases the telephoto end of the lens to 510mm, at the cost of portability. Coupled with a PNY Class 10, 80MB/s card, the TruePic VI processor produced write times of 0.31sec for a single JPEG and 0.53sec for RAW files. In Burst mode the Stylus 1 is capable of shooting up to 70 JPEGs or 25 RAW frames in sequence. After shooting a burst of JPEGs, the buffer cleared in 4.9secs and took 5.9secs for a burst of RAWs. The processor is also powerful enough to provide a live preview of the camera’s ‘Art’ effects on-screen before you shoot. If you’re looking for a long-zoom bridge camera, Panasonic’s Lumix DMC-FZ200 boasts a 24x zoom lens (25-600mm film-equivalent) with f/2.8 across the zoom range. This costs £349, which is significantly cheaper than the Stylus 1. The downside is that it’s bulkier in size, following the conventions of traditional bridge camera design. Alternatively, for just £319 you could pick up a Canon PowerShot SX50. Canon’s bridge camera is also slightly larger than the Stylus 1, measuring 123x87x106mm. On the plus side though, it offers a 50x optical zoom with manual shooting controls and RAW support. The built-in 24-1200mm lens has a wide aperture of f/3.4, but it’s image-stabilised up to 4.5 stops. With capable bridge cameras available for hundreds of pounds less than the Stylus 1, you’ve got to be certain the small form factor and CSC stylings are a priority. If not, and if you’re looking for the best image quality available at this price point, the Stylus 1 isn’t the camera for you. However, if you compare the Stylus 1 to competing compact and bridge cameras, it fares well. It offers an enticing blend of portability, versatility and convenience. With a 10.7x zoom lens and a built-in ND filter feature, the Stylus 1 is a powerful camera. It enables you to shoot in a host of situations and it’s compact enough to fit in a jacket pocket or handbag. That versatility comes at a price though. 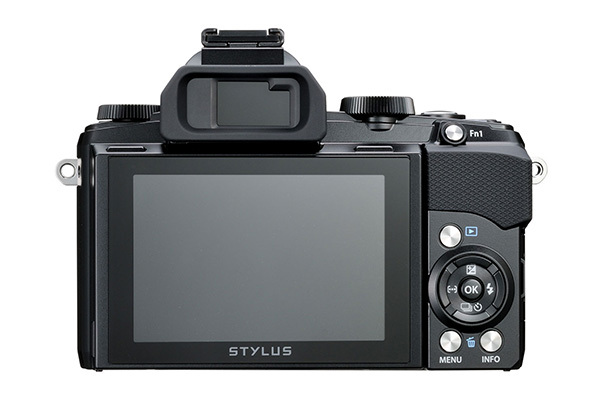 At £549 the Stylus 1 is at the more expensive end of the bridge and compact markets, costing as much as an entry-level D-SLR. For this reason, it will only appeal to enthusiasts who value portability first and foremost. As featured in the April 2014 issue of Digital Photo - download back issues here.